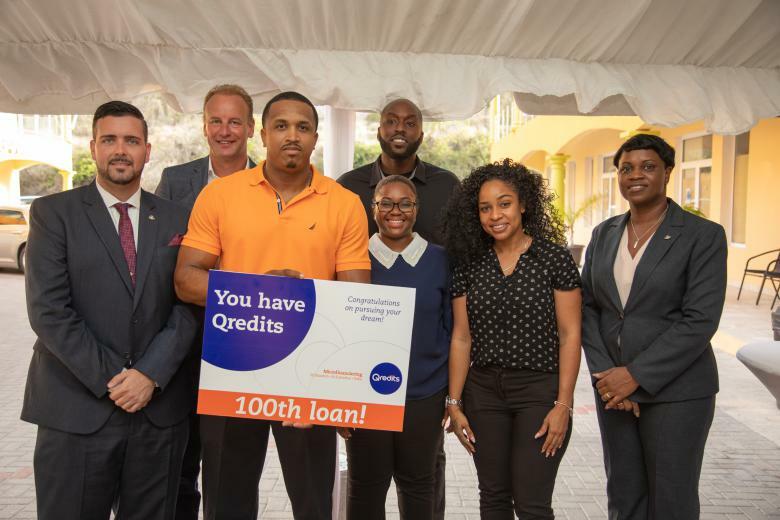 PHILISPBURG – Qredits Microfinancing has celebrated its 100th issued loan for St. Maarten, St. Eustatius and Saba, a milestone achievement. On August 28th, 2018 at the Miss Lalie’s Commercial Center on the Bush Road, the Qredits local team and Qredits CEO marked the special occasion with an event. The festivities were well attended by government officials such as the Honorable Prime Minister Mrs. Romeo-Marlin, Honorable Minster of TEATT Mr. Johnson and Honorable Minister of Finance Mr. Geerlings. Also in attendance were Chamber of Commerce representatives, official Qredits coaches and of course the clients. Initially set to open at the beginning of September, Qredits officially opened its doors just after Hurricane Irma. The focus was then adapted to the situation: assisting storm-damaged small businesses and new entrepreneurs with financing to jump-start their recovery and launch their companies. Thanks to the ongoing assistance and support of the Department of Economic Affairs and the Chamber of Commerce offices on each island, Qredits can offer enormous added value to the growth of entrepreneurship on the SSS islands. In early 2018, Qredits launched their soft loan program with an attractive interest rate of 2% and a one year grace period to further assist the entrepreneurs. The response was over whelming and the number of applications increased significantly, bringing on this achievement of over 100 funded businesses in under a year.